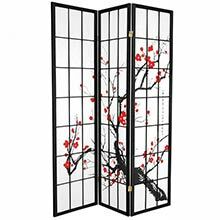 This spectacular Japanese Shoji screen depicts a cherry blossom tree in summer bloom on extra thick rice paper, making it one of our most popular sellers. 4 Panel returning to stock soon. 6 Panel returning to stock soon. The cherry blossom is the national flower of Japan and highly valued for its beauty. All shoji screens ship within 2-3 business days via FedEx ground in the continental U.S and are fully insured. For shipping to any other location, or for expedited shipping, please email us or call us for a rate. We can ship overnight or second-day, and to most other locations in the world. Shipping cost is determined by the options chosen. 14-day Satisfaction Guarantee. If you are not satisfied with this product it may be returned to us within 14 days for a full refund of the product price. Please contact us for return instructions.